I have one question for you, OneHallyu: Do you wanna play with a HOTSHOT? If the answer is “yes,” then you are on the right blog. If you haven’t already caught the HOTSHOT fever, they are a fairly new boy group that debuted in late 2014 with “Take a Shot.” But before they were promoting on music shows, they were creating buzz by having a star lineup, and releasing plenty of videos and song covers. After releasing two singles, HOTSHOT put out their first mini album, “AM I HOTSHOT?,” which garnered an overwhelmingly positive response because of the catchy title track, “Watch Out,” which they promoted, showing impressive live vocals. 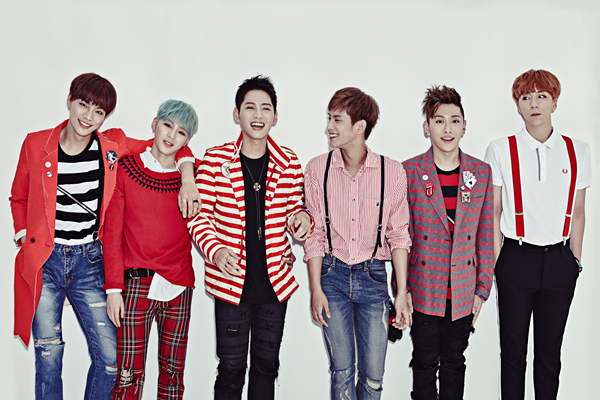 The repackaged album, “I AM HOTSHOT”, had an added single of the same name. 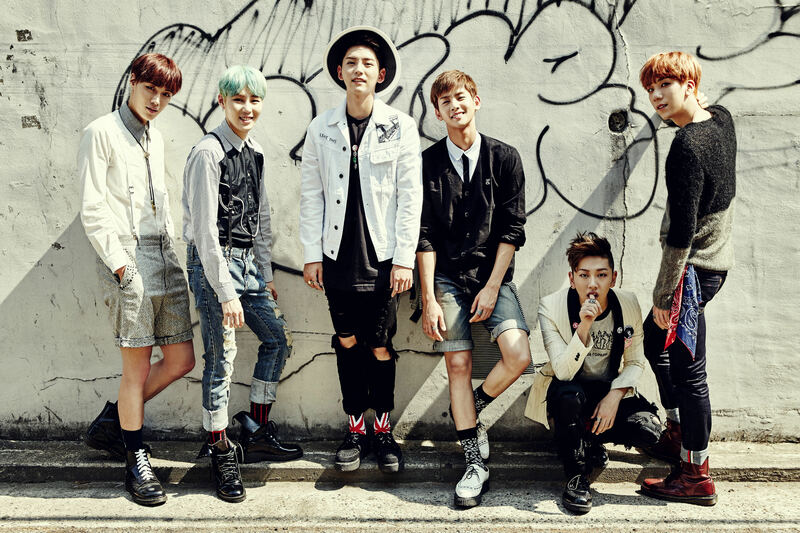 HOTSHOT is comprised of six members. Although some of these faces may not seem familiar at first glance, most will recognize Timoteo, or Moonkyu, as his fans know him. Timoteo was a famous trainee, previously under SM Entertainment, who is packed full of charisma (and he just happens to be close with Taemin of SHINee and Kai of EXO). The ’93 liner has a strong fanbase that initially put HOTSHOT in the spotlight. Kid Monster is a known dancer who is part of a krumping crew (true facts), and he showcases his krumping skills in nearly all of their choreography. Junhyuk was a contestant on Superstar K2, recognizable by his soulful voice and sharp features. Their rapper, San, has a deep voice with a cute, boyish look. Sungwoon, the power vocalist, has a witty personality and a strong stage presence. Then last, but not least, the group is topped off with a smiley visual with a nice vibrato, Hojung. They are fairly similar to idol group Madtown. HOTSHOT debuted at a time when hiphop concepts were the fad, and it was hard to tell if they had staying power, even though “Take a Shot” was a song that you could listen to endlessly without getting bored (I can still listen to it and jam just as hard as I did the first time I heard it). Although I was impressed with their first two singles and had warmed up to one of their main vocalists, Sungwoon, I didn’t start actively following their activities until they put out their mini album. HOTSHOT has hot tracks, but they also post tons of media for their fans to enjoy while they may be in between promotion periods (if you’re the “where are you bae” type of fan, this is for you). They show their charms through their SNS accounts and there is never a selfie shortage. In less than a year, HOTSHOT fans have been able to collect at least 70 Timoteo selfies, which is probably more than the amount that I’ve taken in the past 3 years. They do their best to provide the most in-your-face fan service, which is important for a rookie group to solidify their fanbase. I’m really looking forward to what the individual members have to offer in the future.